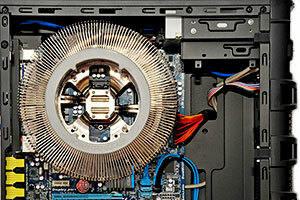 This unusual PC chassis forms an excellent starting point for a good value fanless PC. 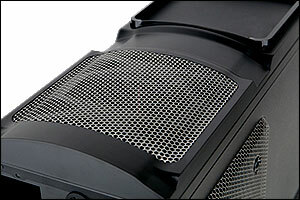 Its hexagon mesh panels promote natural convection air flow and general build quality is excellent. Offering the possibility of using a full-size ATX motherboard for increased expansion, the CS-80 case is well ventilated and is ideal for anyone looking for a case that is suitable for a silent PC build using the Nofan CPU cooler. 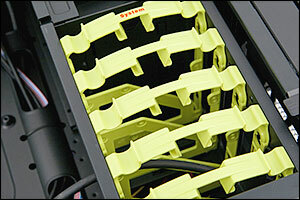 The Nofan CS-80 case is primarily designed with the Nofan CPU cooler in mind however the case cans be used with a convention CPU cooler if required. 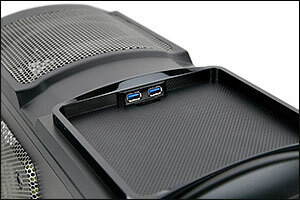 The CS-80 case is well ventilated both on top of the case, directly above the CPU area and also in the side of the case. 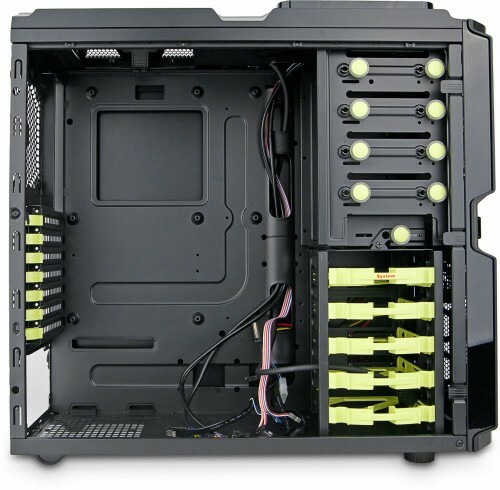 This makes it ideal for use with a fanless CPU cooler like the Nofan where natural convection will ensure cooler air enters from the side and the warm air rises directly out the top of the case above the cooler. 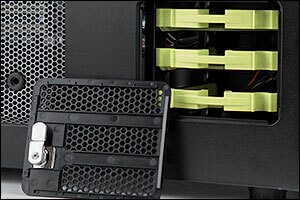 The five 3.5" internal drive bays have been designed so that they require no screws and so fitting a new drive or removing an old one is simple and easy. There is no need to attach SATA and power cables for the first four 3.5" drives in the internal drive bays as Nofan use what they call EZ-SWAP. 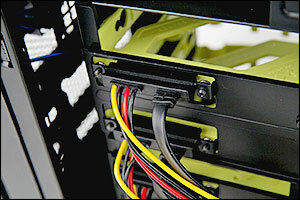 This means that the SATA and power leads to four of the five 3.5" drive bays are already in place at the rear of the drive bay making fitting a new drive easy with a minimum amount of fuss. A small, lockable panel on the side of the case provides quick, easy access for three 3.5" drives and this saves having to remove the whole side of the case just to fit or remove a drive. A tray is provided on top of the case with easy access to two USB 3.0 ports making it an ideal place to charge your phone, MP3 player or attach an external hard drive knowing that they won't accidentally fall or slide off the top of the case. Please Note: The CS-80 case features integral motherboard stand-offs already pre-formed on the inside of the case and therefor the manual is incorrect in saying that the case is supplied with fifteen standoff’s. Only three are supplied and usually, even they are not required. 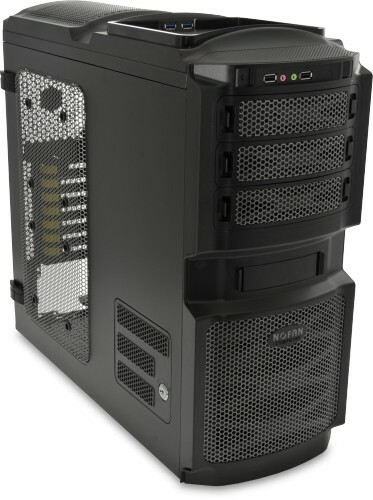 After all these years using some sort of fans in PC parts I finally got tired even of small PC noises and bought this Nofan CS-80 case for my completely fanless PC setup and its perfect match with Nofan CR-95C fanless cooler, which I'm using in this case. Fact, worth mentioning, is that this CS-80 case does have dual row of screw holes for PSU mounting, which is very important for some PSU's (for example SeaSonic Platinum-400 Fanless power supply (SS-400FL2 Active PFC F3) does not have correct set of screw hole placement for mounting it right way, so this small detail in CS-80 case allows you to correctly mount that PSU!). This CS-80 case comes with illuminated NoFan logo in front of case but luckily you can easily detach power connector from PSU and leave it not illuminated. I don't know why almost all manufacturers are obsessed with adding more lights to their products, it's just distracting/unneeded during PC use at night time. But as I mentioned, this is really optional in this case, you can just detach power cord from PSU to this illuminated logo and it won't be a problem. What's else worth mentioning is that disc activity and Power ON lights are not simple dot-type LED diodes like in some other cases but rather stylish "[" and "]" type light stripes, which look cool and luckily they are not too bright so it will not cause significant light emission when running PC in night time. What I also liked in this case is the feature called "EZ-swap" (google it). Excellent, good looking case for no-fan / lo-fan applications. I needed to silence an early (135W) i7 based on a full ATX motherboard. This was recommended by QPC and it was a good choice. The SATA cables for the lower set of drive bays are perilously close to too short (I actually had to get them out and stretch them), but otherwise everything is fine and the components install easily. After some months of use, I can affirm that: It was very easy to mount my computer in this case thanks to its tool-free mechanisms, its design really provides a good temperature control, it's highly expandable and I like the upper tray to charge my phone or other gadgets.